My first time making egg rolls and working with wonton skins turned out to be quite a success! And while the prep is time consuming, trust me, the end result is well worth it! These egg rolls are different in a few ways: they are baked instead of fried, they are mini-sized, and they are served with a hot mustard sauce instead of the usual sweet and sour. To make the filling, simply saute cabbage, carrots, edamame, fresh ginger, garlic, water chestnuts, and peanuts, and season with a mix of soy sauce and rice vinegar (the perfect combination of salty and sweet!). Place a bit of the filling in the middle of a wonton skin, and wrap like a mini burrito, sealing with a bit of egg wash. Bake for about 20 minutes, and you're done! 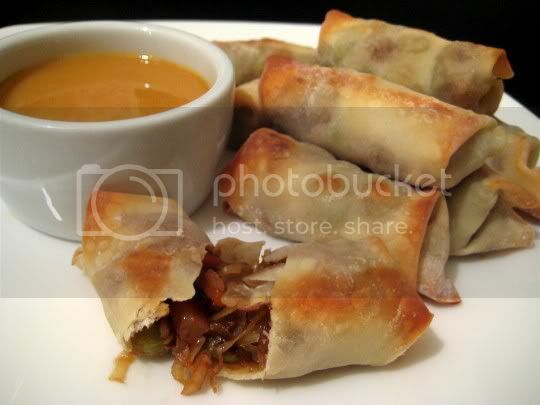 The egg rolls are crispy but not greasy, so you know you're eating healthy! The mixture is delicious, with the edamame, peanuts, and fresh ginger being not-so-typical egg roll ingredients...but they add a wonderful Asian flavor! A few notes... The hot mustard sauce (a mix of ground mustard, honey, rice vinegar, and water) is HOTTTTT. I even added an extra teaspoon of rice vinegar, but that did absolutely nothing. Seriously, the sauce is like eating a heap of wasabi...be careful, your sinuses will be on fire! I couldn't eat this after a couple bites, and since I didn't have any sweet and sour sauce, I whipped up a combo of hoisin sauce, teriyaki sauce, and a little of the mustard sauce for a touch of heat. This was a lot better, but I'd still suggest going the traditional route and using sweet and sour. Also, the recipe suggests that you put the rolls on a sheet dusted with cornstarch (I guess to prevent sticking while making them all), but I would not suggest this, as some of the extra cornstarch is picked up, giving them a sort of powdery coating. There is already a light dusting of cornstarch on the skins themselves, so you don't need any more. You'll probably need to bake these a little longer than the suggested 20 minutes to get some extra crispiness and color. Make again? Definitely! While these aren't quite the traditonal egg rolls, these would be a hit at any gathering. Just get the sweet and sour!